My knitting friend Lisa sent me this beautiful collage. Lisa is a writer, artist, knitter, and lover of color. You can read her blog here. I was so happy to receive this collage in my inbox. 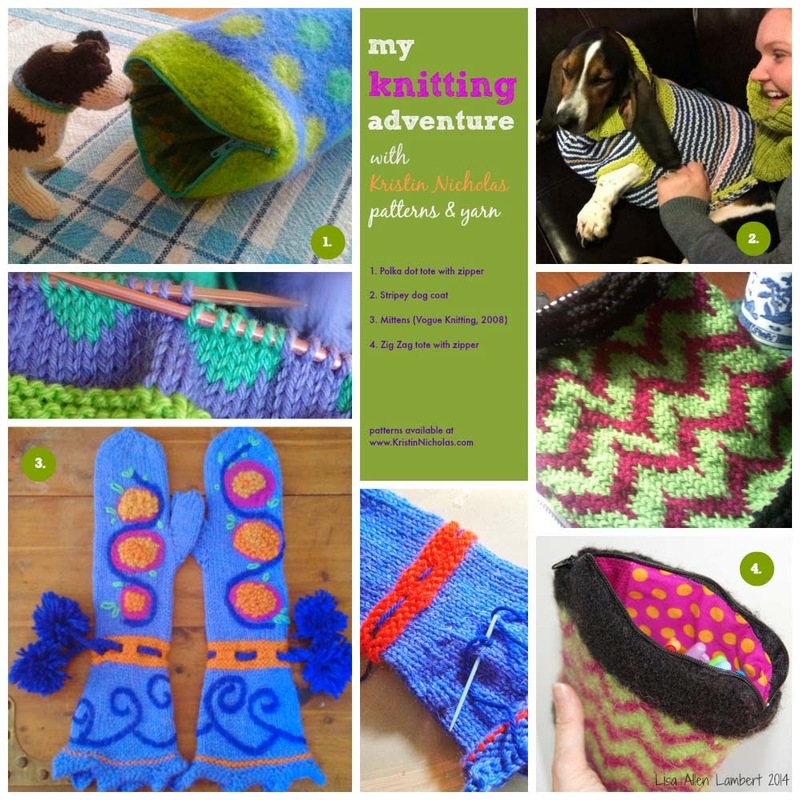 I don't often hear much from knitters who make my designs. I don't poke around on Ravelry very much so I remain in the dark. Thanks Lisa - beautiful job on all the projects (she writes about them on her blog here). The mittens were in an old issue of Vogue Knitting but the other patterns are available on my website. Check out my version of the mittens here. 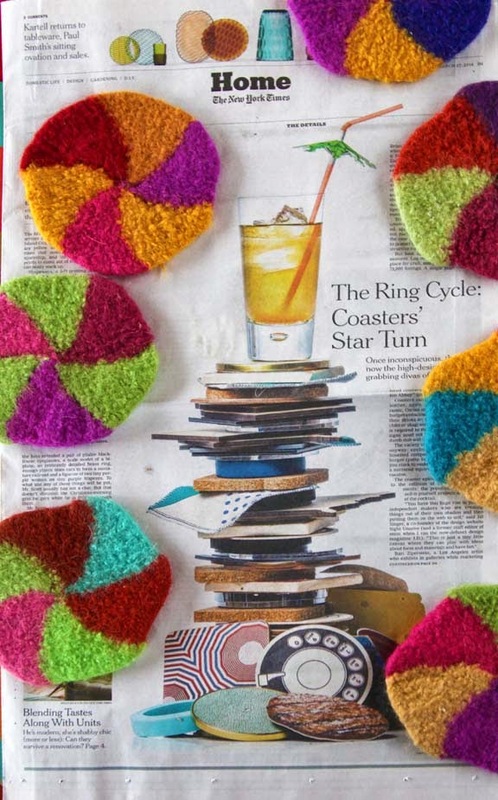 According to the NY Times, coasters are the hot new home accessory. Who'd have thunk? 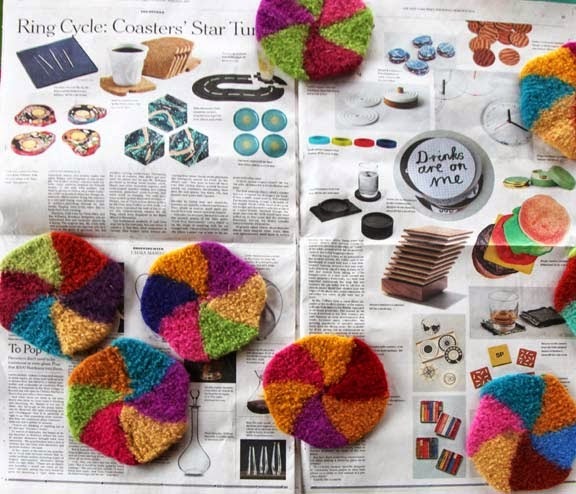 The gist of the article is that with the rise of Etsy, coasters have become a "thing" for artists and makers to sell via their on-line shops. The popularity of cocktails has also added to the renewal of this old-fashioned tabletop accessory. I think coasters are the perfect touch for a tabletop. They also make a nice wedding or shower gift. I suppose I was ahead of the curve with my Swirly Twirly knit and felted coaster pattern. It is a great stash-busting project and includes several different Home Dec accessories. My Swirly Twirly pattern available on my website here or on Ravelry here. 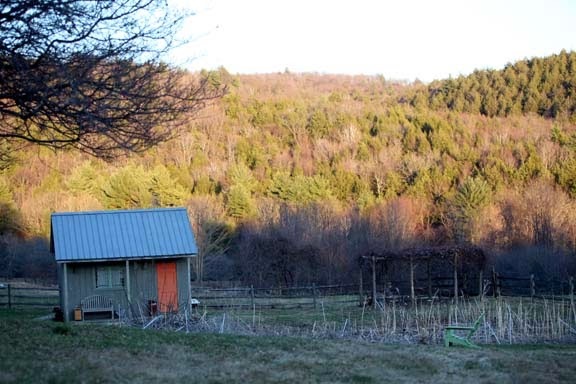 It is a beautiful spring day here at the farm. Green should be happening soon. It is still rather bleak as you can see in the photo I took last night as the sun was setting. Hope you enjoy your day wherever you are. 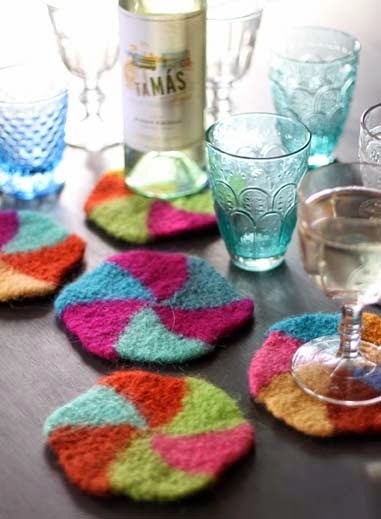 Cute coasters...... I used to have many, perhaps I have now become less trendy!!! JUST picked up (finally) the current Where Women Create---- GREAT article and cover! Yay and Yay!! !